I don't know what's gotten into me, I seem to have gotten bit by a challenge joining bug. I want to set goals and read more books and do all sorts of things. Oh my! One of my big goals for 2015 though is getting rid of some of this clutter in my house and I have SO MANY books and I just can't part with a book without reading it first or re-reading it in most cases. 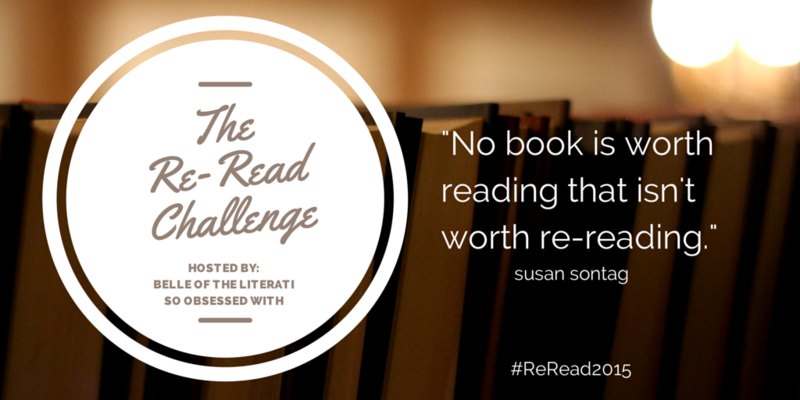 The Re-Read Challenge runs from January 1, 2015 to December 31, 2015. It is being hosted by Belle of the Literati and So Obsessed With. You can find all of the details about the challenge and sign up here. Some books I know I am looking forward to reading (and not decluttering to make room on my shelves) are all of Melanie Rawn's books. Good Omen's By Terry Prachett and Neil Gaiman. The Harry Potter series. Yay! I am excited all ready! 2015 is going to be a fantastic year. That sounds like a fun challenge. I tend to reread books fairly regularly. I have some that I reread each year (Lord of the Rings, I'm looking at you) and others that I'll revisit every few years. I'm planning on reading Good Omens this year, I've never read it before.